The global utility grade duct tapes market is likely to exhibit steady growth in the coming years due to a number of factors, including the rapid growth of the packaging industry and the construction sector, which account for dominant shares in the global consumption of utility grade duct tapes. Utility grade duct tapes account for a variety of roles in a number of sectors due to their diverse applicability for packaging as well as repairing. Growing availability of environmentally viable utility grade duct tapes is also likely to be a major driver for the global utility grade duct tapes market in the coming years. The utility grade duct tapes market is thus likely to exhibit robust growth over the 2017-2022 forecast period, with Transparency Market Research predicting a strong 5.1% CAGR for the utility grade duct tapes market between 2017 and 2022. Transparency Market Research estimates the global utility grade duct tapes market to reach a valuation of US$395.1 mn by the end of 2017 and further rise to US$505.6 mn by the end of 2022. The report segments the global utility grade duct tapes market by application into sealing, repairing, holding, waterproofing, strapping, and others. Of these, repairing is likely to remain the leading application of the global utility grade duct tapes market over the 2017-2022 forecast period. Duct tapes present significant benefits in repairing tasks due to their high adhesive power, especially in the case of advanced modern alternatives, and their easy applicability. Repairing is likely to account for 31.8% of the global utility grade duct tapes market by the end of 2017, with a valuation of US$125.5 mn. The valuation of the repairing segment is likely to rise to US$163.6 mn by the end of 2022, with the segment likely to account for 32.4% of the global utility grade duct tapes market. Geographically, the global utility grade duct tapes market is segmented into North America, Latin America, Europe, the Middle East and Africa, Asia Pacific except Japan, and Japan. Of these, Europe is likely to remain the dominant contributor to the global utility grade duct tapes market over the 2017-2022 forecast period due to the steady rise in demand for DIY applications in Europe. The utility grade duct tapes market in Europe is likely to exhibit a strong 3.7% CAGR over the 2017-2022 forecast period, rising to a valuation of US$152.5 mn by the end of 2022. Despite the dominance of Europe in the global utility grade duct tapes market, North America and Asia Pacific except Japan are also likely to exhibit significant promise for the global utility grade duct tapes market due to the rising presence of the market in these regions. The North America utility grade duct tapes market is likely to exhibit a strong 5.9% CAGR between 2017 and 2022, rising to a valuation of US$145.7 mn by the end of 2022. The APEJ market for utility grade duct tapes is likely to rise to US$138.8 mn by the end of 2022 at a strong CAGR of 5.8% over the 2017-2022 forecast period. Leading companies in the global utility grade duct tapes market include 3M Company, Berry Global Group Inc., Tesa SE Group, Intertape Polymer Group Inc., Shurtape Technologies LLC, Scapa Group Plc, Vibac Group S.p.a., Bolex (Shenzhen) Adhesive Products Co. Ltd., Pro Tapes and Specialties Inc., and Shanghai Yongguan Adhesive Products Co. Ltd. The global utility grade duct tapes market report covers the global market comprehensively to help readers understand the fine points about how the utility grade duct tapes market is likely to grow over the 2017-2022 forecast period. The report includes a detailed assessment of the utility grade duct tapes market’s historical growth figures from 2012 to 2017, enabling analysts to form a solid factual platform on which reliable forecasts for the market’s growth prospects between 2017 and 2022 can be based. Future growth prospects of leading segments of the global utility grade duct tapes market are assessed in the report to provide readers with a comprehensive look at the market’s growth trajectory. Leading drivers and restraints affecting the global utility grade duct tapes market’s growth trajectory are also assessed in detail in the report, enabling readers to understand the key factors likely to play an influential role in the development of the utility grade duct tapes market over the 2017-2022 forecast period. 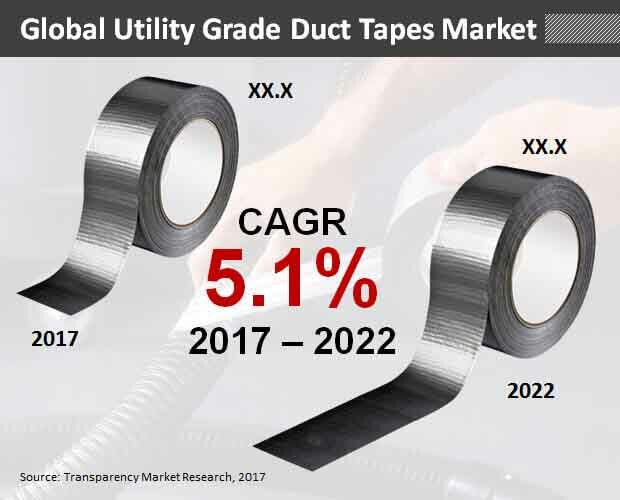 According to Transparency Market Research, the global utility grade duct tapes market is likely to reach a valuation of US$395.1 mn by the end of 2017 and further rise to US$505.6 mn by the end of 2022. The utility grade duct tapes market is likely to exhibit a solid 5.1% CAGR in the 2017-2022 forecast period. Leading drivers affecting the movement of the global utility grade duct tapes market are assessed in the report. The report provides brief elaborations on the quantitative and qualitative effect each major effect has had on the global utility grade duct tapes market and how it is likely to affect the global market over the 2017-2022 forecast period. Key drivers for the utility grade duct tapes market are profiled in the report in order to provide readers with a clear picture of the factors likely to help market operations in the coming years. Key restraints operating on the global utility grade duct tapes market are also assessed in the report to familiarize readers with the factors likely to hinder their operations in the market over the 2017-2022 forecast period. Steady growth of the packaging sector is likely to remain a major driver for the global utility grade duct tapes market over the 2017-2022 forecast period, in addition to the growing adoption of DIY projects, particularly in developed regions such as North America and Europe. Segmentation of the global utility grade duct tapes market is studied in detail in the report with the help of detailed assessments of the leading segments of the market by backing material type, end use industry, and application. The granular structure of the global utility grade duct tapes market is thus revealed to the readers in order to enable them to form comprehensive thought out market strategies that can take into account the dynamics of the utility grade duct tapes market. The detailed assessment of the leading segments of the utility grade duct tapes market provided in the report will enable readers to understand which segments are likely to remain the most promising to invest in in the coming years. Leading players in the global utility grade duct tapes market are profiled in the report to shed light on their product catalogs and market strategies. The degree of success witnessed by key strategies is described in the report to provide readers with a clear idea of what is likely to work and fail in the utility grade duct tapes market over the 2017-2022 forecast period. Leading companies in the global utility grade duct tapes market include 3M Company, Berry Global Group Inc., Tesa SE Group, Intertape Polymer Group Inc., Shurtape Technologies LLC, Scapa Group Plc, Vibac Group S.p.a., Bolex (Shenzhen) Adhesive Products Co. Ltd., Pro Tapes and Specialties Inc., and Shanghai Yongguan Adhesive Products Co. Ltd.